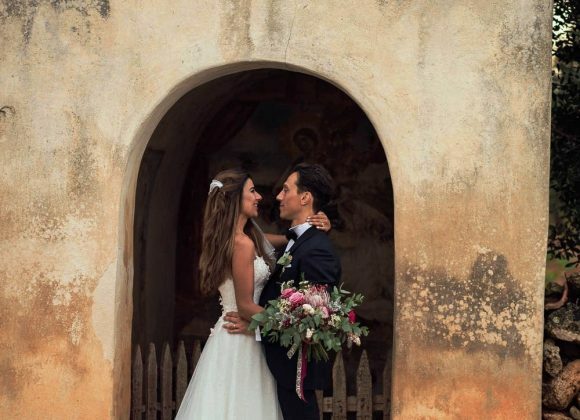 Vogliamo raccontarvi, attraverso gli scatti e le frasi dei nostri sposi, quello che sarà il vostro matrimonio alla Masseria Fulcignano. Chiudete gli occhi e provate a immaginare i tramonti colorati di rosso e azzurro, provate a respirare il profumo del mare, degli ulivi, della salvia del rosmarino e del timo, provate a immaginare un cielo pieno di luci e stelle, questa è la terra che celebrerà il vostro amore. Il Salento nel vostro cuore. 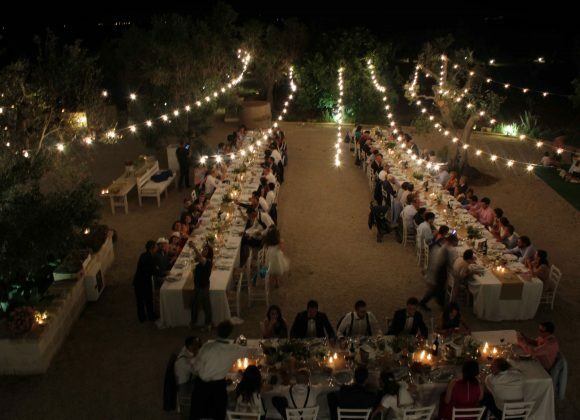 We had our wedding here this month and can’t recommend visiting Masseria Fulcignano enough. Stefano and his wonderful team were fabulous. We had all the rooms booked out with friends and family over our wedding. They accommodated us in every way. The facilities were perfect. 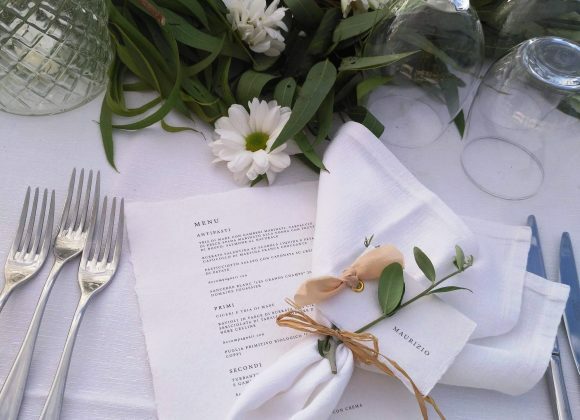 The Masseria felt intimate but equally looked after. They catered for small children in our party also.The breakfast and all food that was provided, was wonderfully authentic and unpretentious. Our wedding was fantastic. We cannot wait to go back next year and cannot thank Stefano enough for making our dream wedding come true. Grazie Mille!!! 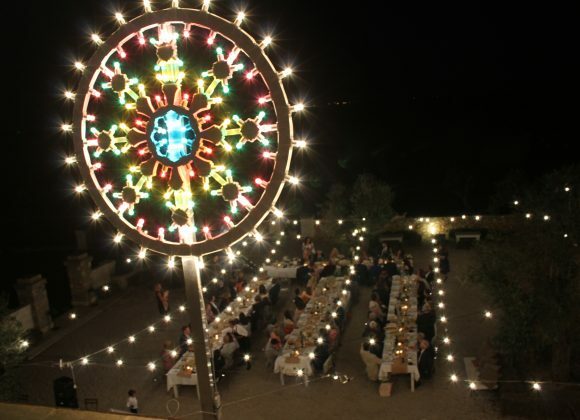 Everything about Masseria Fulcignano is wonderful, the venue, the staff, the food…one of the most relaxing places I have ever stayed. 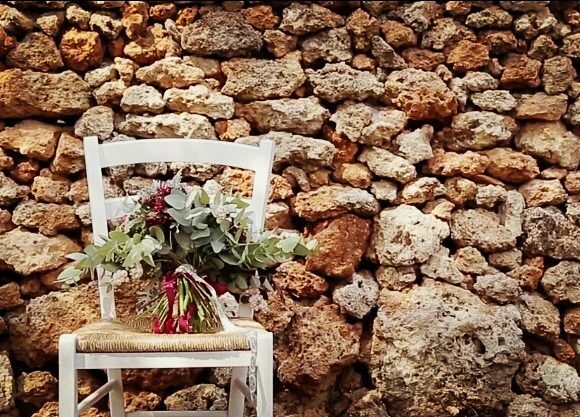 Foremost the owner Stefano has remarkable taste and is an incredible organizer, perfectionist and paid tireless hours of attention to every little detail as we reserved the entire masseria’s 16 rooms for 5 days for our dream wedding!! This beautiful charming modern property sits in an exclusive private Olive and Wine estate yet so close to the beaches and all the best towns and sights of Salento. Stefano’s front desk was staffed by Irina perhaps one of the most charming warm hospitable, personable and thoughtful front desk managers we have encountered in all our travels! Every staff member including Letizia, the incredible chef who cooked better than many Michelin restaurants we have eaten at and all the rest of the helpful wait staff who prepared beautiful coffee and the most delicious spritz and cocktails we enjoyed all the over the property as well as by the beautiful new pool. We saw every single room at this property. While each room is slightly unique they are all charming, clean, tastefully modern with beautiful beds and cool local chic finishes. The bathrooms are from out of this world: spacious, modern and the waterfall showers are to die for! I don’t know how some of the other reviewer’s could find anything to complain about the breakfast but between the fresh pastries, croissants, homemade cakes, incredible coffee and fresh juices, all the fresh local fruit, our discerning guests never wanted to leave!! If you’re looking for an exclusive unique and truly luxurious experience in Salento you would be hard-pressed to find any option better than this one! Yes it does take a GPS to find the property since it is located on a smaller road between Galatone and Secli…But in its remoteness lies some of it’s charm!! Yes it does have a limited staff and so may not feel like your typical five-star resort… but the staff that they do have here more than make up for it with their friendliness and genuine desire to make sure every guest has a truly memorable stay!! Another suggestion to the property we made was to add a full length mirror to some of the rooms missing one. Our family and closest friends hated leaving this place and already forced us to host another reunion here which we hope to someday soon! 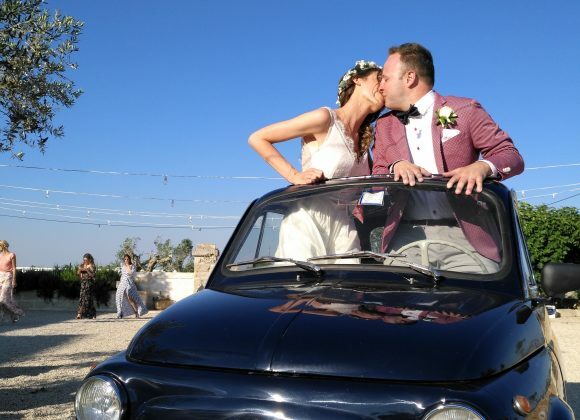 Il nostro matrimonio salentino si è svolto ieri in masseria Fulcignano.. mille volte lo rifarei ancora lì.. bellissima location, personale gentile e discreto, strepitosa atmosfera, mood salentino d’eccellenza.. mille grazie Damiano e Anna Trove’. 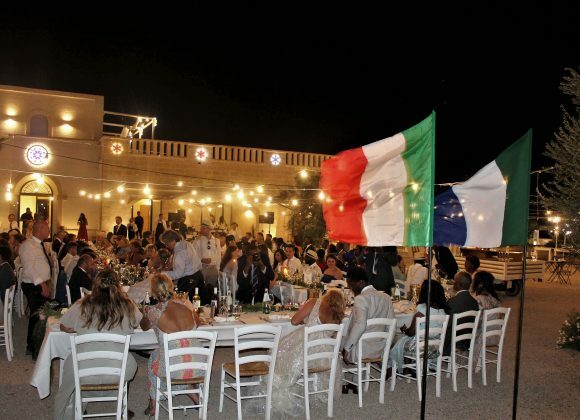 Sono stata presso Masseria Fulcignano in occasione di un matrimonio a luglio 2017. Sono rimasta incantata da tutto quanto: la location è una vera antica masseria salentina, curata nei dettagli in modo raffinato rispettando la sua identità, con un delizioso giardino con porticato, prato e piscina, una grande “aia” antistante la masseria ricca di alberi di ulivo che, per la serata, era stata sistemata con tantissime lucine appese, creando un’atmosfera sognante che ben si adattava al matrimonio country-chic caratterizzato da una lunga tavolata con sedie bianche di legno, un’unica tavolata (a staffa) proprio come nei matrimoni di una volta.Ho amato tutto di quel matrimonio, anche il prelibato cibo: io sono vegetariana e con grande cortesia e professionalità lo staff è riuscito a non farmi “pesare” la cosa, offrendomi dei piatti assolutamente allo stesso livello di quelli degli altri commensali (cosa che in altre location non sempre avviene, purtroppo). Una nota speciale per la gentilezza, la cordialità e la professionalità dei proprietari e di tutto lo staff, con menzione speciale per la dolce Marcella sempre presente e disponibile. 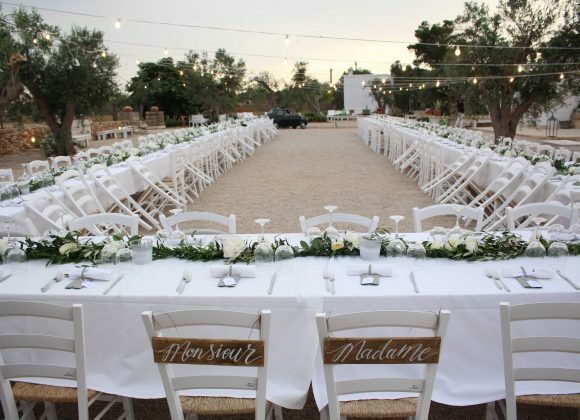 Insomma, un vero e proprio romantico matrimonio country-chic, in un’atmosfera gioiosa ed elegante, con garanzia di qualità e ottima riuscita dell’evento. This hotel is a true oasis and just a wonderful location for any sort of holiday. 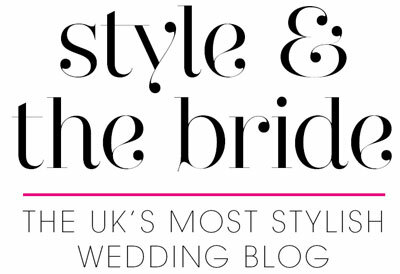 We stayed last week for our friend’s wedding and to say that the hotel, its staff and every aspect of the experience was just exceptional, just doesn’t do the place justice. 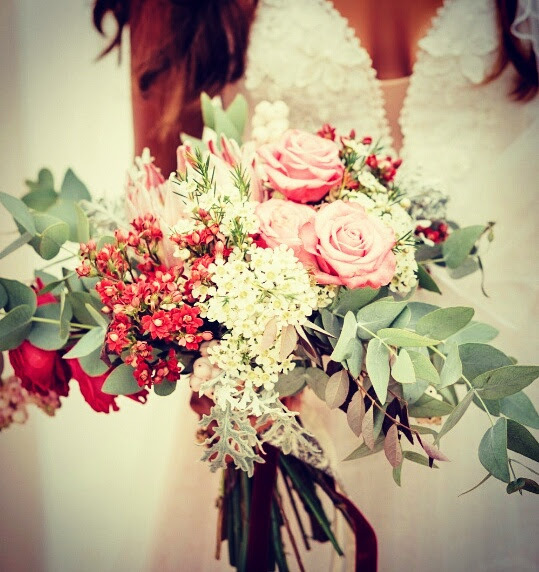 On arrival, we were greeted by one of the most professional and charming people we have ever had the pleasure to encounter – Ira went above and beyond to make sure that every detail was perfect. Claudio, her colleague was equally attentive and on the night of the wedding we met the owners who have done an amazing job with this haven! 100% guys, you’ve done an amazing job! !